You ask your child what they want to eat. You are greeted with, “I don’t know” – this is the best case scenario in my opinion. The other option is your child tells you exactly what they want only to refuse to eat it. And..if it’s a really bad day it might even end in a tantrum. You may feel like you are giving your child a million options and they are still not happy. It does to me too! Just this morning, I was in a rush trying to get lunch packed and breakfast served all while trying to get out the door on time. I’m sure you can all relate to how this is no easy feet! In my kind of groggy, not really interested in being creative, head I densely ask my daughter, “What do you want for breakfast?” I knew what her response would be as soon as it left my mouth, but I was hoping just once she would know. Now keep in mind, my daughter is 5 1/2 years old at this point and has the verbiage for this dialogue. However, what happens when you have a 1 or 2 year old that doesn’t quite get it yet? Children have very little understanding about nutrition and what a balanced meal looks like. If you are thinking that you’ve been talking about nutrition with your kids and you think they do understand you should check out this post. Rather than asking your child what they want try these ideas instead. Young children will do best when you do your job as the parent and decide WHAT to serve. They are not yet ready to make these decisions. Leaving them in charge can result in them not learning to like a variety of food and eating well. Children do like to take the easier way out – if they can pick a familiar food they will. If you want more detailed information you can download my free guide, 5 Foods To Serve at the Table. Young children struggle to understand their emotions. They may keep asking for a million different snacks or keep telling you they are hungry. The truth is they may be feeling tired, bored, happy or sad. As parents, having structured meals and snacks will help you to know if they are hungry or having some other type of emotion. You can get more details about understanding your child’s emotions versus hunger here. Our brains can’t do two things well at once. This means watching a screen, reading a book or playing will interfere with your children filling up. Children who eat walking around or grazing often undereat or overeat because they are not mindful about their appetites. 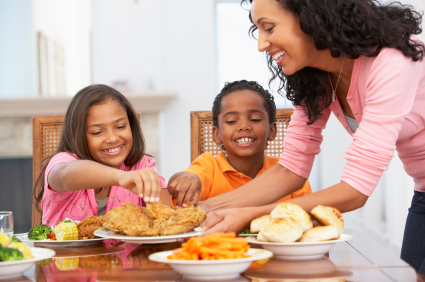 Children benefit from having sit down snacks at the table where they can focus on their eating. Do you want grapes or apples? Would you like pancakes or waffles? Would you like sausage or bacon? They are able to handle smaller amounts of choices. Then a the parent you can round out the meal to include balance. 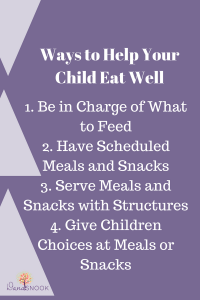 In order to raise your children to do best with their eating, grow up to eat a variety of food, and learn to eat for hunger and fullness they will benefit from you taking the lead and deciding what and how much to serve. 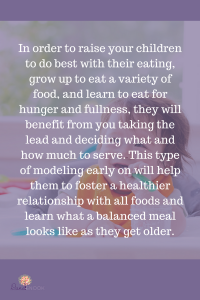 This type of modeling early on will help them to foster a healthier relationship with all foods and learn what a balanced meal looks like as they get older. I started to consult with Dana for my first child 2 ½ years ago. Thanks to Dana’s advice, my daughter progression from nursing, to starting solid foods, and then eating table foods was extremely smooth and with a lot less stress than I imagined! Like many new moms, my schedule is crazy and hectic, but with Dana’s help, feeding my daughter wasn’t. She was able to suggest many new and exciting foods to try while using foods my husband and I eat and buy at the grocery store and are easy to prepare. Teaching us how to feed our daughter created good habits for my husband and I too. We started eating as family and are now part of our daily routine. When we added our second child to the mix, I felt like I was learning all over again. I somehow seemed to forget exactly how and what to feed him. Although, he is a totally different child personality wise, her advice is helping him to grow into a good eater too. We are very excited with both our children’s responses to Dana’s methods. It has been so nice to have Dana available to ask questions and support us along the way.